Jeffrey Dean Morgan makes for an amazing Ben Affleck Batman replacement in new fan made image. The beginning credits of 2016’s Batman v Superman: Dawn of Justice showed us the tragic Bruce Wayne backstory where we witnessed the fates of Martha and Thomas Wayne at the hands of an unknown assailant. Both roles played by The Walking Dead stars Lauren Cohen and Jeffrey Dean Morgan. An image uploaded to Instagram by Hamza Javed depicts Jeffrey Dean Morgan as Thomas Wayne playing the role of Batman from the classic Flashpoint storyline from the comics. Now that we’ve seen the end of Ben Affleck’s run as the dark knight, it’s up to the fans to speculate on what could have been. Jeffrey Dean Morgan was one of the versatile actors who fans wanted to see play the iconic superhero before Ben Affleck was announced to have landed the role. DC and Warner Bros. have never experimented with giving the fans a feature film with Thomas Wayne as the main protagonist. We’ve always gotten films from Bruce Wayne’s perspective either becoming or already fighting crime as The Batman. It would be a breath of fresh air to see this sometime in the future. Perhaps in a feature film or even a television series. It’s always a possibility with the theme of multiverses becoming a thing so we’ll just have to wait and see. 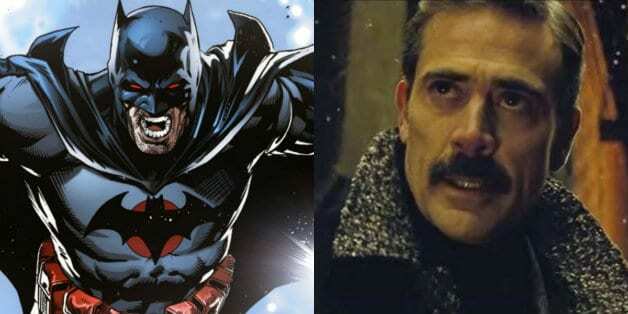 What do you think of the fan art portraying Jeffrey Dean Morgan as Bruce’s father Thomas Wayne? Let us know your thoughts in the comments below! The DCEU continues with Shazam! on April 5, 2019, Birds of Prey (And The Fantabulous Emancipation of One Harley Quinn), on February 7, 2020, and Wonder Woman 1984 on June 5, 2020. A standalone Joker film set outside of the DC Films universe starring Joaquin Phoenix as the Clown Prince of Crime is also set to hit theaters October 4, 2019. Warner Bros. and DC Films are also developing The Flash standalone film, Green Lantern Corps, Black Adam, Cyborg, Supergirl, New Gods, and Nightwing. Plot details for Matt Reeves’ film are currently under wraps. The film is said to revolve around a young Caped Crusader and Matt Reeves has previously confirmed that it will not be directly based on Frank Miller’s Year One comic. The Batman is set to open in theaters on June 25, 2021. Stay tuned to Heroic Hollywood for the latest news on all upcoming DC Films projects! Omg ill love to see that!! ! Lol these entire articles devoted to a single panel of fan art, the weakest form of journalism EVER! Live from the refrigerator !!!! Why is this considered newsworthy? And what’s worse…why do I keep clicking on this crap?